Angus Reid has released a huge poll of over 6,000 respondents, and it confirms the double-digit Conservative lead observed by five other polling firms recently. This poll's field work coincided in large part with the field work of the most recent EKOS poll. The latter is most probably an outlier, as it is the only recent one showing a modest Tory lead. With a poll of this size, one would expect the results to approximate recent polling averages. That is indeed the case for BC, AB and QC. In Ontario, the results also correspond to recent averages within the margin of error, but they are on the favourable side for the Tories (13% lead). In Manitoba and Saskatchewan, the Tories are significantly higher than suggested by most other recent polls, but the seat impact of this is minimal. The most interesting numbers in this poll are from Atlantic Canada, where the size of the sample allows Angus Reid to break the results down by province. The main lesson, which is very useful for projections, is that the effect of the ABC campaign in Newfoundland and Labrador has vanished. Thus, the moderate shift to the Tories in Atlantic Canada since 2008 is actually a big shift in NL and a small one elsewhere. The Tory average national lead increases to 11.6%. The latest Abacus poll contradicts the EKOS poll, and suggested that the Tories have in fact maintained their double-digit lead over the Liberals, or have actually regained it after losing it momentarily. (Abacus conducted its polling on 2/23, while EKOS polled on 2/10-22.) The Tory-Grit gaps in these two polls, 5.1% and 15%, are statistically different from each other, so now we really need another pollster to weigh in. The biggest disagreement between the two polls is in Ontario, where Abacus has the Tories leading by 10%, while EKOS had the Grits marginally ahead. 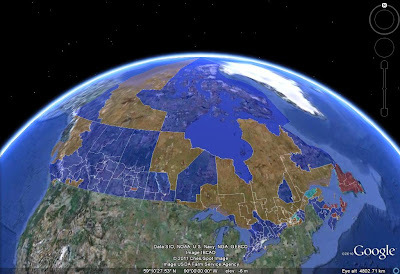 (Well, strictly speaking, the difference in Alberta was even larger, but who cares.) 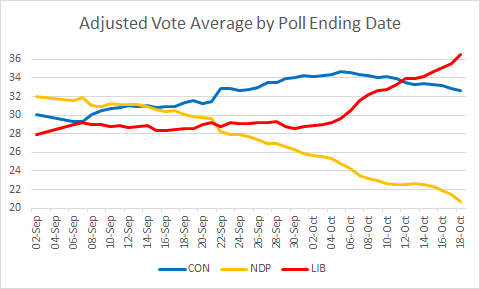 Abacus also showed strong NDP numbers, but this is in line with its previous polls. Typically, internet pollsters like Abacus and Angus Reid appear to show higher NDP numbers than phone pollsters - perhaps some less lazy person could crunch the numbers on this. The weighted average Tory lead is 10.9%. The latest EKOS poll has the Tories ahead by just 5.1%, compared to 12.5% in the previous poll. This change is statistically significant, though it would still be prudent to wait for some confirmation before stating that the Conservative lead has been drastically cut. Importantly, this poll shows the two major parties even again in Ontario. However, the average Tory national lead does shrink noticeably, and is now 10.1%. A couple of disastrous polls for the Liberals this week: Ipsos and Harris-Decima. Both have the Tories ahead in Atlantic Canada (interpret with caution due to small samples), and both have the Tories ahead by 9-10 points in Ontario, more than their margin in the 2008 election. 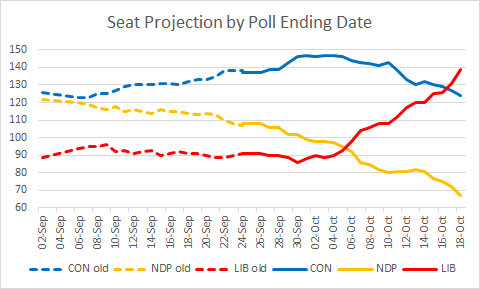 Adding these polls and a Léger provincial poll to the projection basis makes the Tory gain no fewer than 10 seats! The weighted average Tory national lead also jumps to 10.7%, just a whisker less than their margin of victory in 2008. Note that because Tory support has become more efficient, their projected seat count is actually higher than in 2008. This week's EKOS is good news for the Tories and atrocious news for the Grits: the Conservatives lead by 11.2% in Ontario, and are almost 4% ahead of the Liberals in Québec. The results elsewhere are actually par for the course for the two main parties, though the NDP gets low numbers across the board. However, the average Tory national lead jumps to 8.9%. Note that taking this poll alone would put the Tories on the cusp of a majority. One poll this week: Ipsos Reid confirming the polling consensus everywhere except in Ontario, where it puts the Liberals in front by 4 points. This pulls the Tory national lead down to 5 points. Ipsos also has the federalist vote split almost equally four ways in Québec, though of course the Green 12% is suspiciously high. However, the Conservatives' average popular vote lead drops to 7.3%.